Yesterday I passed by a Burger King in the food court and saw an advertisement for their new cheese & jalapeno burger. 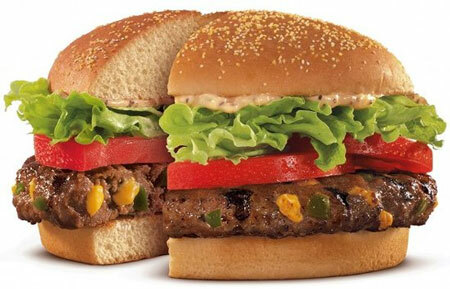 This new burger features one of their “steak” sized patties that is embedded with bits of jalapeno and cheddar cheese. I’m sorry, but this doesn’t look like something that you’re supposed to eat. Besides that, I’ve never seen lettuce or tomato at any Burger King that look this good. I’m all for seasoned meat, but this nasty patty is anything but appetizing.